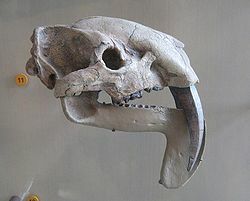 Thylacosmilus was a genus of saber-toothed marsupial predators that lived in parts of South America, primarily Argentina. It was not a relative of the saber-tooth cat and is in the same grouping of Kangaroos, and has absolutely no relation to cats whatsoever. It was equipped with large teeth and powerful shoulders, both of which allowed it to dismantle its prey. Thylacosmilus' sabre-teeth kept growing throughout its life, unlike the sabres of true saber-tooths. It also had a pair of elongated, scabbard-like flanges growing from the lower jaw, designed to protect the sabre-teeth when it closed its mouth. This page was last modified on 28 January 2013, at 17:42.